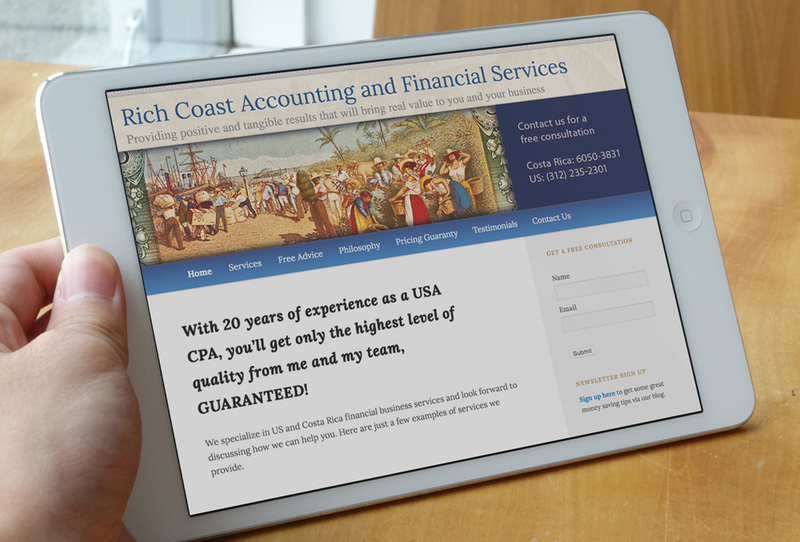 Rich Coast Accounting & Financial Services carried 20 years of experience in to a new business to help the many US citizens in Costa Rica who need help managing their accounting and financial needs. They needed a website to formalize an online presence, attract new customers, generate leads, and serve as a credentials site to making a great impression on the many clients they planned to network with in person. 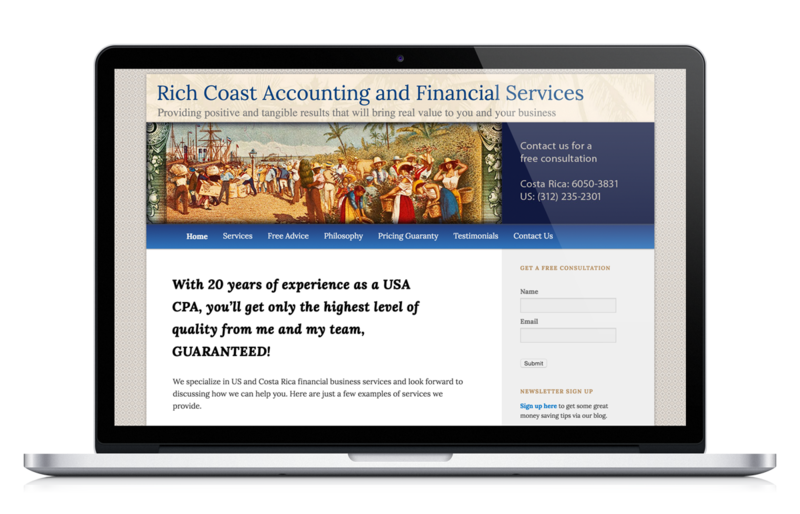 Robert from Rich Coast wanted to put a lot of information on his site. It was my job to take the information he had written, organize it, and find the best place possible for it on the site, while creating a look and ensuring that visitors to the site had multiple opportunities to be converted into customers in a pleasant way. I always start a website by sketching out the organization, flow, and structure. This ensures a user-friendly experience. 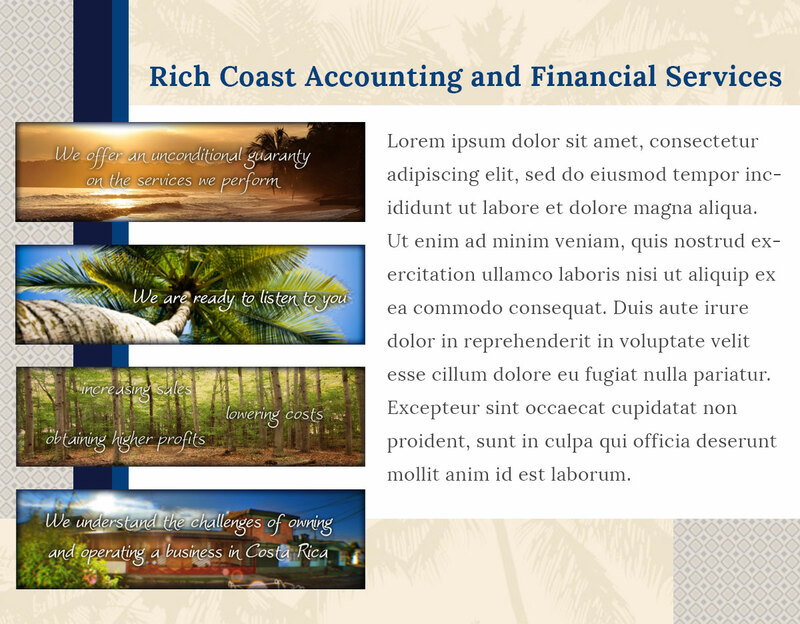 The term Rich Coast is the translation of Costa Rica and a very clever name for a Costa Rican financial business targeting English-speakers. I wanted to carry this cleverness through the look of the website. I used rich dark blues and warm earth tones to convey feelings of trust, confidence, and elegance. I incorporated subtle textures reminiscent of textiles found in posh tropical get-a-ways. I chose a serif font for its classic roots in history. These elements combined together to form a very elegant, classy site that appealed to US citizens in Costa Rica on a very deep level.